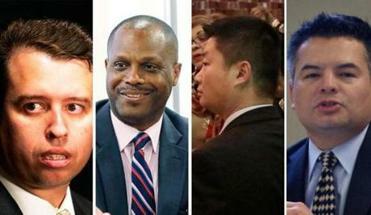 Conflicting information has been presented this week on the academic credentials of one of the four finalists for the Boston school superintendent job. The website for the Boston school system had said for nearly a week that Guadalupe Guerrero, a deputy superintendent in San Francisco and a former Boston school principal, was on hiatus from a doctoral program at Harvard University’s Graduate School of Education. But a Globe review of the academic credentials of Guerrero and the other three finalists revealed that Harvard terminated him from the program last fall. Guerrero, who entered the doctoral program in 2008 and gained a permanent high-ranking leadership role in San Francisco in 2010, said in an e-mail Wednesday night that he ran out of the allotted time to complete his dissertation. Each of the four candidates will take part in a daylong series of public interviews next week. 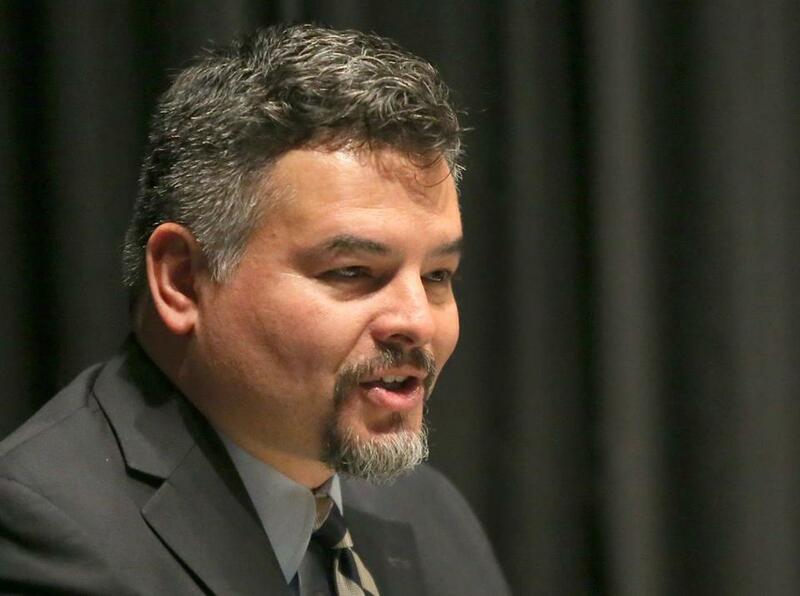 “Given that I have been working in this deputy superintendent position (or as an assistant superintendent before this) and my work schedule has been so demanding, sacrificing almost every vacation day the last few years (winter, spring, and summer), as you might imagine, is just not sufficient time to research/write and stay on track academically,” Guerrero said. The credentials of the three other finalists — Dana Bedden, Pedro Martinez, and Tommy Chang — all checked out. Verifying Guerrero’s credentials at Harvard proved more difficult. He initially refused to allow the university to release any information about his doctoral studies, or whether he had earned the two master’s degrees from Harvard he listed on his Boston job application. But Wednesday night, Guerrero lifted the privacy restriction at the request of the Boston School Committee chairman, Michael O’Neill. O’Neill made the request after fielding questions from the Globe about Guerrero’s situation at Harvard. Later that night, Harvard confirmed Guerrero holds a master’s degree in school leadership and another in education policy and management, and also said Guerrero was terminated from the doctoral program. Jill Anderson, a spokeswoman for Harvard’s education school, said she could not share the reason for his termination, citing student privacy rights, and could not confirm Guerrero’s assertion that he had run out of time to finish his dissertation. Most education doctoral candidates at Harvard complete a dissertation within four to seven years, she said. At the education school, candidates choose as their dissertation topic a “profound question facing the world of education” and “conduct an in-depth quantitative or qualitative” research to answer it, Anderson said. The topic must be approved by a committee on degrees, which reviews a written proposal. The candidate then chooses three faculty members to oversee the research and writing. Guerrero said Thursday night that he submitted his dissertation proposal in the fall, but the committee on degrees bounced it back with edits and other feedback for him to address. That, he said, prevented him from completing the dissertation within the required seven years. Candidates at Harvard have two years from the time the committee on degrees approves the proposal to complete the work. Robert Peterkin, who formerly ran the doctoral program at Harvard’s Graduate School of Education, said Thursday it is not uncommon for those who hold high-level positions to run out of time to complete their dissertations. Often, he said, these individuals must file appeals with an updated timeline for completion to be reinstated. He also confirmed that Guerrero was terminated from the program because he ran out of time, calling it “unfortunate” but understandable. The program’s current director, Deborah Jewell-Sherman, also verified the information through Anderson, the spokeswoman. “I think Guadalupe will be an excellent superintendent,” said Peterkin, who added he felt Guerrero was ready to lead Boston schools. Guerrero said he is still weighing whether to file an appeal. O’Neill took responsibility for some of the confusion over Guerrero’s status in the doctoral program. He said that Guerrero was upfront with the search committee that he no longer was enrolled, but wanted to resume his pursuit of a doctorate when his schedule allowed. Because of that explanation, O’Neill said he decided to add to Guerrero’s biography on the school system’s website that he was on hiatus — a characterization that was incorrect. He also said Guerrero noticed the error last week and tried to get the school system to fix it, but the department did not follow through. The information was finally corrected Wednesday night. James Vaznis can be reached at jvaznis@globe.com. Follow him on Twitter @globevaznis. Nestor Ramos, Matt Rocheleau, and Peter Schworm of the Globe staff contributed to this report.